16 Court of the "Pigna"
17 Fountain of the "Galera"
41 Fountain of the "Aquilone"
61 Hall of the Pontifical Audiences "Paul VI"
63 House of hospitality "Gift of Mary"
Saint Peter's Square is at 19 meters above sea level and the highest part of the Vatican Gardens is at 77 meters. The territory covers a maximum length of 1,045 meters and width of 850 meters. Enclave in the City of Rome. 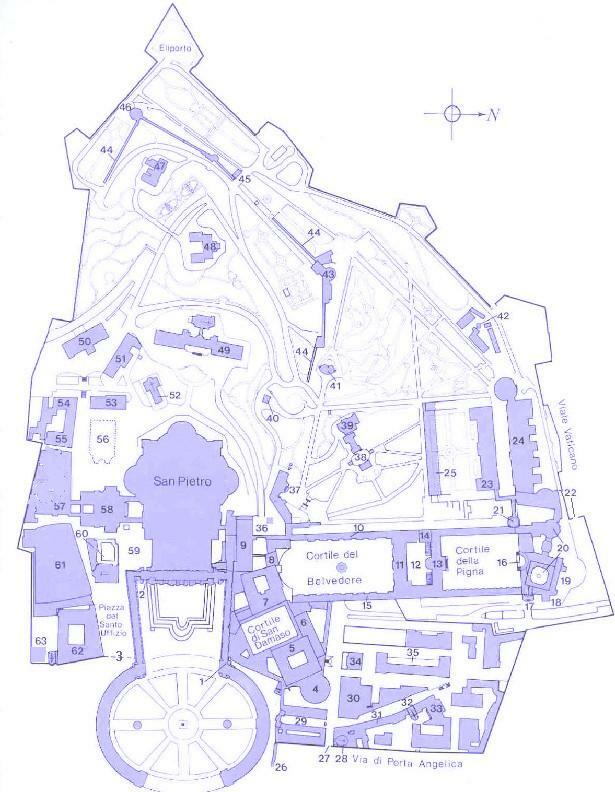 The State of Vatican City covers an area extending from a short distance from the right bank of the Tiber and includes a slight elevation, of what was anciently known as the Vatican Hill, the old Ager Vaticanus on which summer villas were built during the republican period. Caligula constructed there his private circus, in which, as in the adjacent gardens, the early Christians would seem te have been martyred. To the north of the circus, along a secondary route, there was a necropolis in which Saint Peter was buried. Between the years 324 and 326 Constantine erected over the place of the tomb of the first Pope, an imposing basilica which was replaced by the actual one built between the 16th and the 17th century. The entire territory of the State of Vatican City is placed under the protection of the La Haye Convention of 14 May 1954, concerning the safeguard of cultural goods in case of armed conflict. The Vatican City is thus recognized - and this is so also in international discipline - as a moral, artistic and cultural patrimony worthy of being respected and protected as a treasure belonging to humanity. From 1984 the State of Vatican City is registered in the World Heritage List. There exist some minor areas outside State territory and located within Italy which enjoy extraterritorial rights, such as the Basilica of Santa Maria Maggiore, San Giovanni in Laterano and San Paolo fuori le Mura, with adjacent buildings; some palaces and Roman villas which house pontifical administrations; the villas and Palace of Castel Gandolfo, which is the summer residence of the Pope; the area located in Cesano (Santa Maria di Galeria) at about 25 km from Rome [Italian]. The expression Holy See refers to the supreme Authority of the Church, and thus the Pope as Bishop of Rome and head of the College of Bishops. Defines therefore the Central Government of the Catholic Church. As such, the Holy See is an institution which, according to the international laws and customs, has a juridical personality which permits it to sign treaties and to send and receive diplomatic representatives, as juridical equivalent of a state. The State of Vatican City came into existence with the Lateran Treaty between the Holy See and the Kingdom of Italy on 11 February 1929 and ratified on 7 June 1929, by which Italy recognized the full property rights and exclusive sovereignty on the Vatican as it is made up at present . It is a very small territorial entity, with the purpose of making it possible for the Pope to exercise freely his Ministry of governing the universal Church . The State of Vatican City and the Holy See, both sovereign subjects of international public law , universally recognized , are indissolubly united in the person of the Supreme Pontiff, as Head of State , who possesses full legislative, judicial and executive powers. In periods of "Sede Vacante" (Vacancy of the Apostolic See), these powers belong to the College of Cardinals. The Supreme Pontiff governs the State through the Pontifical Commission for the State of Vatican City (legislative power; composed of cardinals, nominated by him for a 5 year period) and the Governatorate of the State of Vatican City (executive power). The legislative regulations are published in a special supplement of the Acta Apostolicae Sedis. The judicial power is exercised, in the name of the Supreme Pontiff, by the constituted organs according to the juridical structure of the State: a Magistrate, a Court of First Instance, a Court of Appeal and a Court of Cassation. The Supreme Pontiff represents, through the Secretariat of State, the State of Vatican City in relations with foreign States, for the conclusion of Treaties and for diplomatic relations. Between 1870 and 1929, when the State of Vatican City did not exist, the Holy See maintained diplomatic relations with many States. Diplomatic envoys to the Holy See, with a certain stable character, are found since the end of the XV century. In the XVI century the constitution of permanent representations began. The Holy See, besides the active right of diplomatic representation (the Apostolic Nuncio is a pontifical Representative, who covers the permanent function of representation of the Roman Pontiff with States and with the local ecclesiastical hierarchy), exercises the passive right, which means that it receives Representatives sent by States in extraordinary and temporary mission or ordinary and permanent mission. Both the State of Vatican City and the Holy See, as the sovereign organ of the Catholic Church, have obtained an ever growing recognition of their distinct international character. They are members of international organizations and participate in international conferences according to the relative agreements. 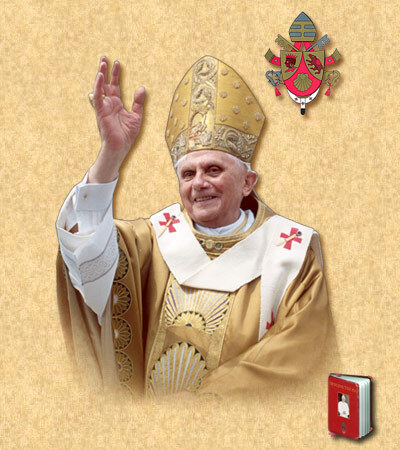 Head of State: His Holiness Benedict XVI, 265th Pontiff, born as Joseph Ratzinger in Marktl am Inn, diocese of Passau (Federal Republic of Germany) on 16 April 1927. Secretary of State: Cardinal Tarcisio Bertone, S.D.B. [English, Italian] , from 15 September 2006. President of the Pontifical Commission for the State of Vatican City and the Governatorate of the State of Vatican City : Archbishop Giovanni Lajolo [English, Italian] , from 15 September 2006. The Supreme Pontiff is elected by cardinals who are not yet 80 years old, united in a conclave , according to the rules set by the Apostolic Constitution Universi Dominici gregis [English, French, German, Italian, Portuguese, Spanish] of John Paul II, dated 22 February 1996 , concerning the Vacancy of the Apostolic See and the Election of the Roman Pontiff. The College of cardinals [English, French, German, Italian, Portuguese, Spanish] is made up of 3 ranks (episcopal, presbyterial and diaconal) and is composed of cardinals who are freely selected by the Pope and who are at least clerics having received the presbyterate. The Deacon, who is the cardinal bishop of the Suburbicarian Church of Ostia, presides the College of cardinals: Cardinal Angelo Sodano [English, Italian], from 30 April 2005. The Roman Curia consists of institutions which assist the Holy Father in the government of the Church: Secretariat of State (divided into Section of General Affairs and Section for the Relations with the States); Congregations (for the Doctrine of the Faith, for Oriental Churches, for Divine Worship and Discipline of the Sacraments, for the Causes of Saints, for Bishops, for the Evangelization of Peoples, for the Clergy, for Institutes of Consecrated Life and Societies of Apostolic Life, for Catholic Education); Pontifical Councils (for the Laity, for Promoting Christian Unity, for the Family, for Justice and Peace, "Cor Unum", for the Pastoral Care of Migrants and Itinerant People, for the Pastoral Assistance of Health Care Workers, for Legislative Texts, for Inter-religious Dialogue, for Culture, for Social Communications); Tribunals (Apostolic Penitentiary, Supreme Tribunal of the Apostolic Signature, Roman Rota); Offices (Apostolic Chamber, Administration of the Patrimony of the Apostolic See, Prefecture of the Economic Affairs of the Holy See); Other Institutions of the Roman Curia (Prefecture of the Pontifical Household, Office of Papal Liturgical Celebrations, Holy See Press Office, Central Statistics Office of the Church); Pontifical Commissions (for the Cultural Heritage of the Church, for Sacred Archeology, Biblical, for the Revision and the Emendation of the Vulgate, "Ecclesia Dei"); Pontifical Committees and the Commissions of Cardinals; Institutions connected with the Holy See (Vatican Secret Archives, Vatican Apostolic Library, Vatican Typography, L'Osservatore Romano, Vatican Publishing House (Libreria Editrice Vaticana), Radio Vatican, Vatican Television Center, Fabric of Saint Peter's, Office of Papal Charities), Labor Office of the Apostolic See, Pontifical Administrations and Delegations. The Papal Military Corps, with the exception of the Swiss Guards, were disbanded on 14 September 1970 under the Pontificate of Paul VI. The external security of the State of Vatican City is taken care of by the Inspectorate of Public Security to the Vatican (Italian State). Acquisition and loss of citizenship, authorization to reside in the State of Vatican City and formalities to enter, are set out in the Law N. III of 7 June 1929, on citizenship and residence, and in the Regulation N. XXXVI of 27 September 1932, for entrance to Vatican City. Monetary unit: euro of the Vatican, at parity with the unified European currency in circulation from 1 January 2002. O Rome immortal of Martyrs and Saints, O immortal Rome, accept our praises: Glory in the heavens to God our Lord, And peace to men who love Christ! To You we come, Angelic Pastor, In You we see the gentle Redeemer,The Holy Heir of true and holy Faith; Comfort and refuge of those who believe and fight. Force and terror will not prevail, But Truth and Love will reign.